Out with BCS #233 is a new episode of The BCS Audio Vault podcast: 027 Bent the Wing, Dark the Cloud by Fran Wilde, the tale of an apprentice craftswoman and her father who must confront themselves in order to save their business and family. 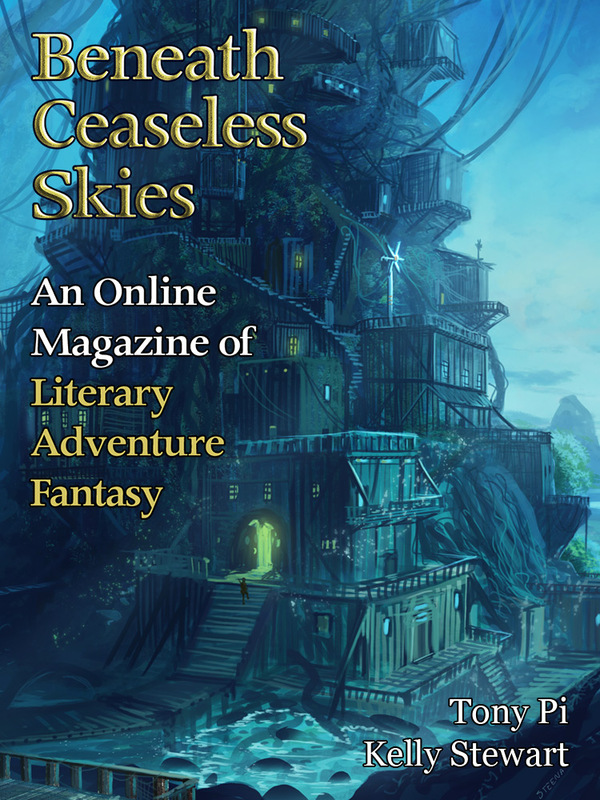 It’s introduced by the author, explaining the story’s and characters’ connection to the Bone universe world of the story and her novels Updraft, Cloudbound, and Horizon. To hear new episodes of The BCS Audio Vault, including stories by Saladin Ahmed, Yoon Ha Lee, and Chris Willrich and introductions by Aliette de Bodard, Rajan Khanna, and Lou Anders, subscribe to The BCS Audio Vault via RSS feed or look for it on iTunes. BCS #233 is out today, featuring stories of justice and breaking from norms. Marissa Lingen (“Out of the Woods” in BCS #218 and podcast BCS 189, “Out of the Rose Hills” in BCS #173, “Cursed Motives” in BCS #105 and podcast BCS 091, “The Six Skills of Madame Lumiere” in BCS #46, among many others) returns to BCS with “Across Pack Ice, a Fire,” a story of seeking justice for another people and atonement for herself. Mel Kassel offers “Gallows Girl,” in which a character questions her personal role in justice. BCS #233 features a new episode of the BCS Audio Vault podcast: 027 Bent the Wing, Dark the Cloud by Fran Wilde, the tale of an apprentice craftswoman and her father who must confront themselves in order to save their business and family. 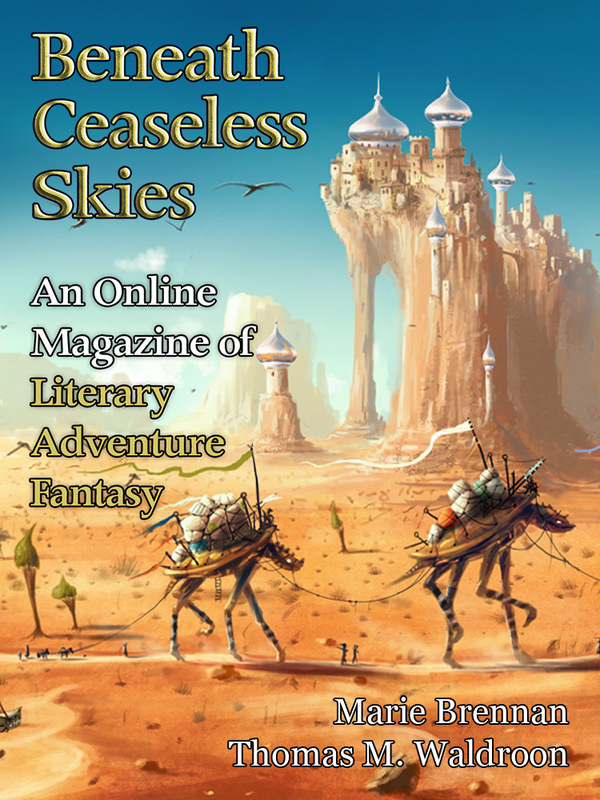 It’s introduced by the author, explaining the story’s and characters’ connection to the Bone universe world of the story and her novels Updraft, Cloudbound, and Horizon. All behind a new crop of our cover art for late summer in the Northern Hemisphere: “Bird House” by Jordan Grimmer. BCS #214 is out today, featuring a returning BCS author, a new one, new cover art, and a new episode of the BCS Audio Vault podcast. Bonnie Jo Stufflebeam (“A Careful Fire” in BCS #184 and podcast BCS 160, “The Girl with Golden Hair” in BCS #176 and podcast BCS 153, and “Everything Beneath You” in BCS #164 and podcast BCS 142) returns with “The Orangery,” a story blending the mythic with characters fighting beyond role. Priya Sridhar offers “The Jeweled Nawab Jungle Retreat,” a story of a character similarly fighting to break free of the role attributed to them. The BCS Audio Vault podcast has a new episode BCS Audio Vault 026: Everything Beneath You by Bonnie Jo Stufflebeam, from January 2015. It’s introduced by the author, explaining the very personal genesis of this story and some of its elements, including a boat, a dragon, and a lantern festival. The From the Archives story with BCS #214 is “The Coffinmaker’s Love” by Alberto Yáñez in BCS #131, our Fifth Anniversary Double-Issue in October 2013. All behind new cover art for the end-year season: “The Sacred Flames” by Jinxu Du. BCS #207 is out today, featuring stories set in vivid historical settings, the return of the BCS Audio Fiction podcast, and a new episode of the BCS Audio Vault podcast. 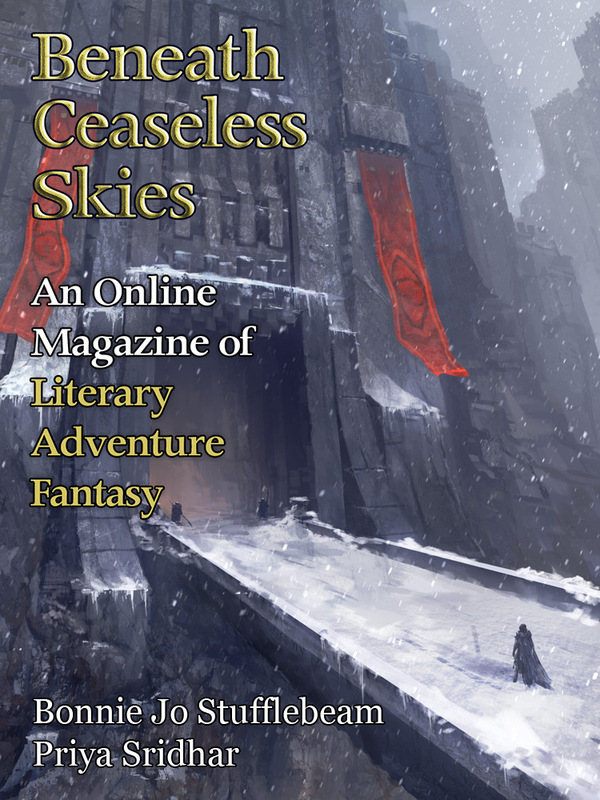 Marie Brennan (“The Ascent of Unreason” in BCS #104 and podcast BCS 089, plus two other Driftwood stories; “And Blow Them at the Moon” in BCS #50 and podcast BCS 044, plus one other historical fantasy; among nine others) returns to BCS with “To Rise No More,” a new historical fantasy set in the world of her Onyx Court fairie novels. 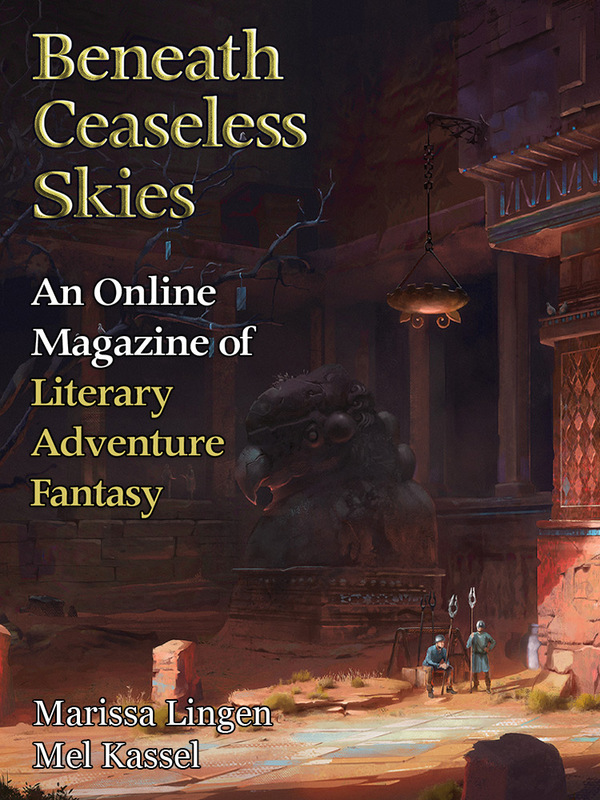 Thomas M. Waldroon (“‘Or I Wil Harrie Them Out of This Land’” BCS #198, and “Sinseerly A Friend & Yr. Obed’t” in BCS #171 and the new anthology Best of BCS Year Seven, out early exclusively and on sale at Weightless Books) offers a third historical fantasy in his series of uniquely voiced literary interpretations of pre-modern America: “George & Frank Tarr, Boy Avencherers, in ‘Beeyon the Shours We Knowe!!! !’,” a lyrical tale of two brothers on a strange river journey that is not what it seems. The BCS Audio Fiction Podcast episode is BCS 181: To Rise No More, the Marie Brennan historical fairie tale. It’s guest-narrated by Liz Duffy Adams, who narrated BCS 161: Unearthly Landscape by a Lady by Rebecca Campbell last fall. The BCS Audio Vault podcast features a new episode BCS Audio Vault 025: And Blow Them at the Moon by Marie Brennan, a previous story in the same Onyx Court historical fairie setting as “To Rise No More.” It’s introduced by the author, explaining how she works the plots of her novels and stories into history without sidelining the actions taken by real people. Our new anthology Best of BCS Year Seven is out early exclusively at Weightless Books and is on sale–buy now and get a free BCS anthology of your choice! See Weightless Books for info. Out today is new episode of The BCS Audio Vault: 025: And Blow Them at the Moon by Marie Brennan, read by T.D. Edge. Like her new BCS story “To Rise No More” appearing in BCS #207 next week, it’s set in the world of her Onyx Court historical fairie novels. BCS Audio Vault 025: And Blow Them at the Moon is introduced by the author, explaining how she works the plots of her Onyx Court historical fairie novels and stories into history without sidelining the actions taken by real people. 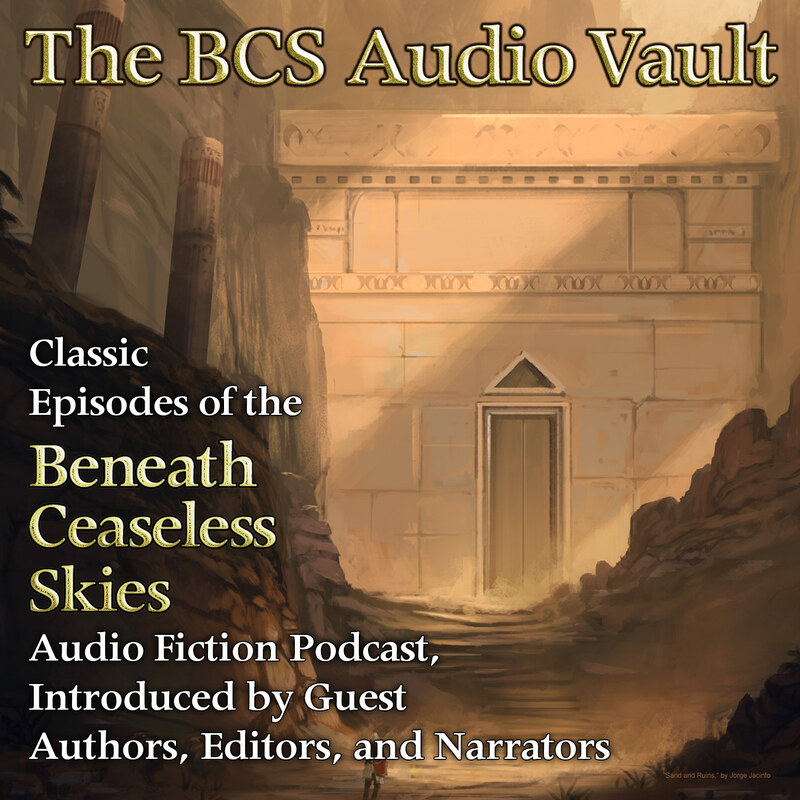 To hear a new episode of The BCS Audio Vault every fortnight, including stories by Aliette de Bodard, Marissa Lingen, M. Bennardo, and Chris Willrich and introductions by Marie Brennan, John Meagher, and Lou Anders, subscribe to The BCS Audio Vault via RSS feed or look for it on iTunes. BCS #206 is out today, featuring two authors new to BCS. Claude Lalumière visits an alternate North America and French Canada in “The Patchwork Procedure,” a high-flying espionage caper with a protagonist facing a dilemma of loyalty. Jeremy Sim follows children escaping military oppression in “What Pada-Sara Means to the Elephant,” a tale featuring confrontations of will via a board game. The From the Archives story with BCS #206 is “The God Thieves” by Derek Künsken, from BCS #84, a spy caper not unlike “The Patchwork Procedure” but set in an alternate Renaissance Genoa. The BCS Audio Fiction Podcast is on a brief hiatus. In the meantime, peruse our episodes from earlier this year and from 2015, including two recently named finalists for the 2016 Parsec Awards, F/SF highest awards for podcasting: BCS 150: The Punctuality Machine, Or, A Steampunk Libretto by Bill Powell, a special large-cast reading featuring multiple guest narrators, and BCS 173: The Sweetest Skill by Tony Pi, guest-narrated by John Meagher. BCS #199 is out today, featuring two stories of protagonists venturing into unknown reaches. 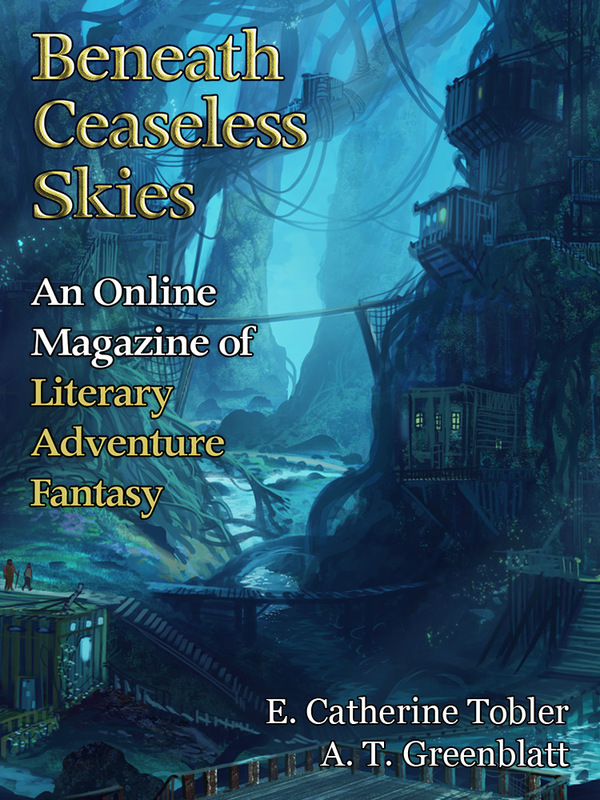 E. Catherine Tobler returns to BCS with “Cloud Dweller,” another story set in the same world-traveling circus setting as several of her previous BCS stories (“Splitskin” in BCS #172,“We, As One, Trailing Embers” in BCS #147 podcast BCS 127, “Artificial Nocturne” in BCS #126, “Lady Marmalade” in BCS #98), featuring a tightrope-walker walking across the reaches of the sky. A.T. Greenblatt offers “They Said the Desert,” a story of a dogged protagonist crossing a desert trade route while hounded by a past companion. The BCS Audio Fiction Podcast episode is BCS 175: They Said the Desert, the A.T. Greenblatt story. BCS #199 also features a new episode of the BCS Audio Vault: 024 The Topaz Marquise by Fran Wilde, a dark tale of a craftsman caught between his own desires and ancient forces. It’s introduced by the author, explaining the titular gemstone and the protagonist’s relationship with it. 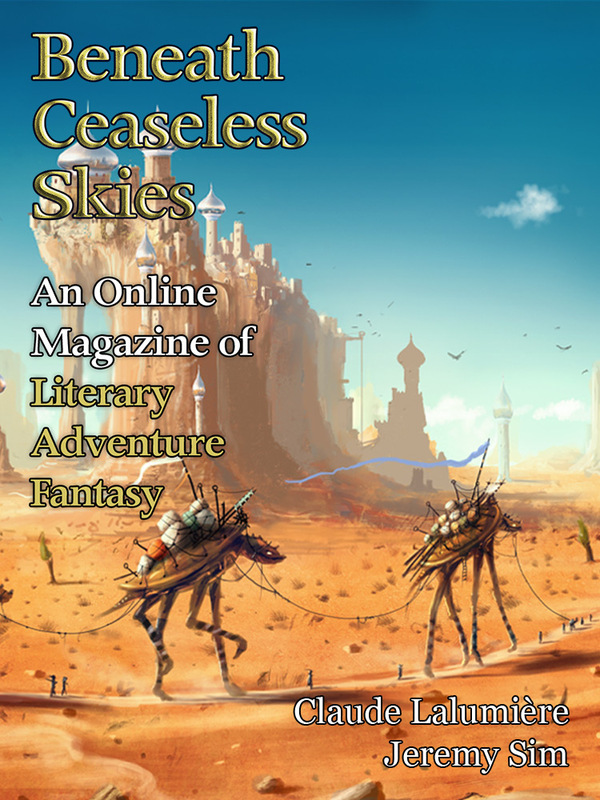 Out today is a new episode of The BCS Audio Vault: 024: The Topaz Marquise by Fran Wilde, a dark tale of a craftsman caught between his own desires and outside forces that may be far more ancient to this world and far more dangerous than he will admit. It’s introduced by the author, explaining the titular gemstone of distinctive color and cut, the protagonist’s relationship with it, the role of such gemstones in this world and its history, and their connection to other stories in this world. BCS #197 is out today, with two stories featuring animal secondary characters and protagonists who must engage with them. Tony Pi (“No Sweeter Art” in BCS #155, “The Curse of Chimère” in BCS #53, among others) returns to his candy hawker sorcerer from “No Sweeter Art,” which was a finalist for the Aurora Awards, in “The Sweetest Skill.” It’s a new tale in which Tangren Ao must treat with competing zodiac animal spirits in order to aid his city’s god. Kelly Stewart in “Rabbit Grass” shows a young protagonist wary of a tricksy animal character who asks her for help. The BCS Audio Fiction Podcast episode is BCS 173: The Sweetest Skill, Tony Pi’s story of candy-sculpting sorcery and zodiac animal spirits. It’s guest-narrated by audio book narrator John Meagher, who has narrated many past BCS podcast episodes, including BCS 133: No Sweeter Art, one of Tony Pi’s previous tales of Tangren Ao and zodiac spirits. That podcast was named a finalist for the Parsec Awards. BCS #197 also features a new episode of the BCS Audio Vault: 023: No Sweeter Art by Tony Pi, that previous tale of Tangren Ao that was a finalist for the Parsec Awards last year. It’s introduced by narrator John Meagher, talking about the story and its narration. The From the Archives story with BCS #197 is “One Ear Back” by Tina Connolly, from BCS #97 and podcast BCS 084, a tale in which human and animal characters must engage with each other. All behind another view of our new cover art for early spring for our Northern Hemisphere readers: “Forest” by French artist Geoffrey Icard.